Home / health / Coconut Potash, Most Healthy cooking Potash. Coconut Potash, Most Healthy cooking Potash. 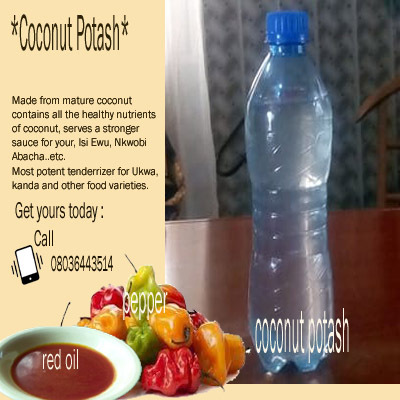 Coconut Potash is this super healthy potash prepared from mature coconut which offers you a stronger, healthier sauce for the preparation of all kinds of African delicacies like Ugba, Nkwobi , Abacha, Okporoko (stockfish), Ukwa (breadfruit) and Isiewu (Goat head) etc. Unlike other Potash used in cooking , Coconut Potash has a unique taste which stands out in African cuisine all over Africa. Used also in food tenderizing.